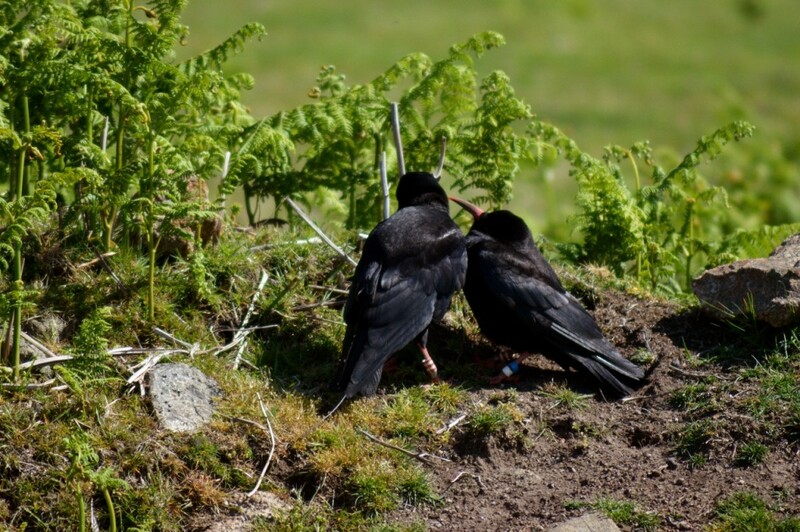 Easter may have been early this year, but our chough eggs waited until April was in full swing to make an appearance. The first sign of egg-laying at the Wildlife Park was on 12th April when the nest cameras revealed an egg in Iseult’s nest. Within a week she had finished laying and started incubating. 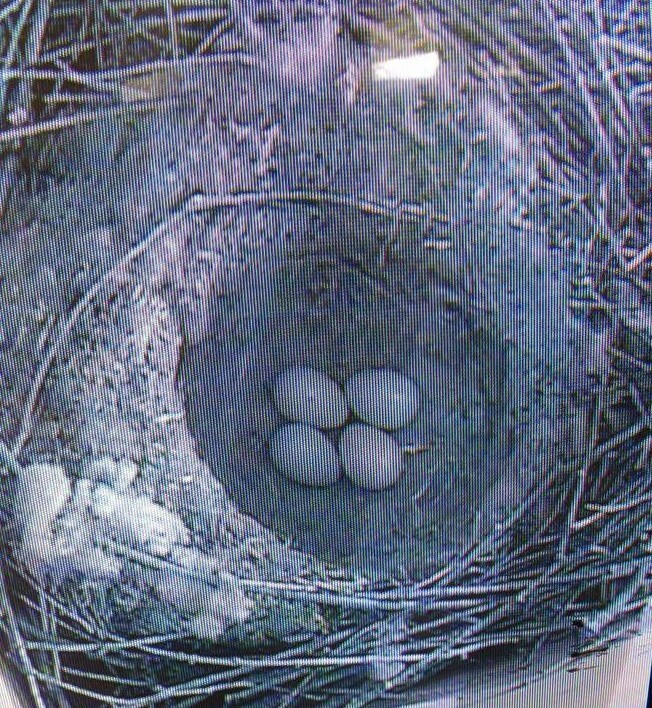 Iseult’s eggs – view from the nest camera monitor. Photo by Hester Whitehead. 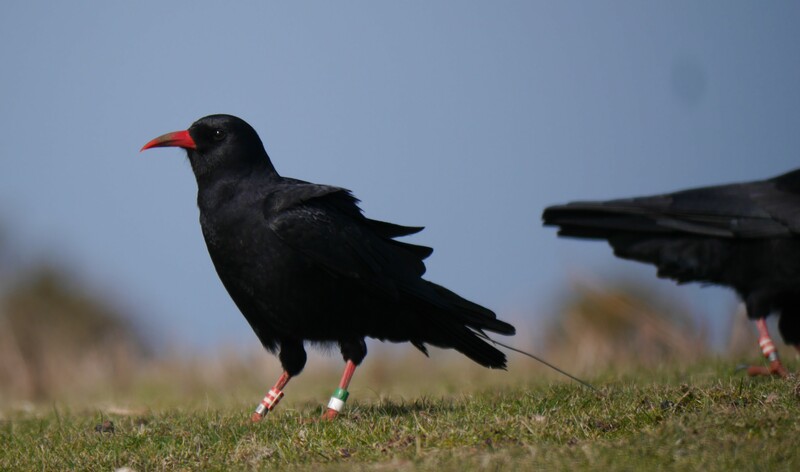 Choughs normally lay around five eggs in captivity with the female starting incubation when the third egg is laid. Issy appeared to be quite restless at first, leaving the nest whenever she was disturbed. 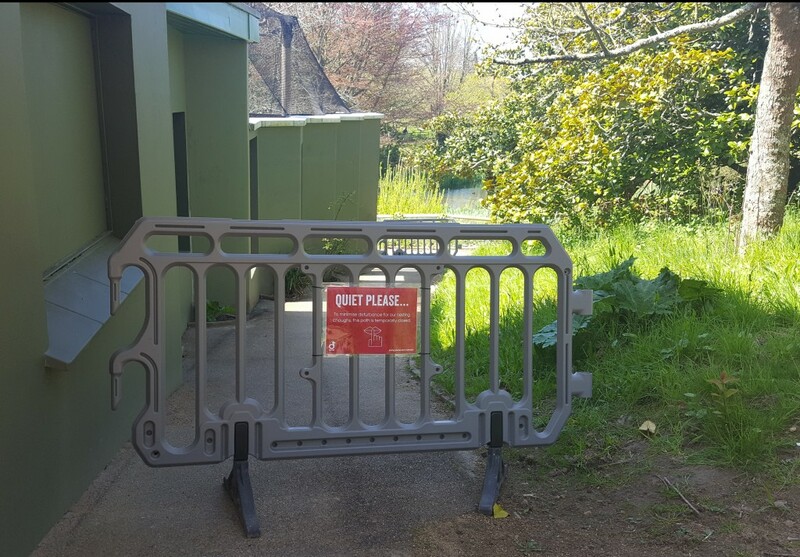 As the aviary is on show to the public the decision was made to cordon off the footpath which runs alongside the nest site. This seemed to work well and Issy continued incubating. The public footpath was blocked to prevent disturbance to the nest whilst Isuelt was incubating. Photo by Liz Corry. Egg-laying for the other two breeding pairs in the Park was not as straightforward. 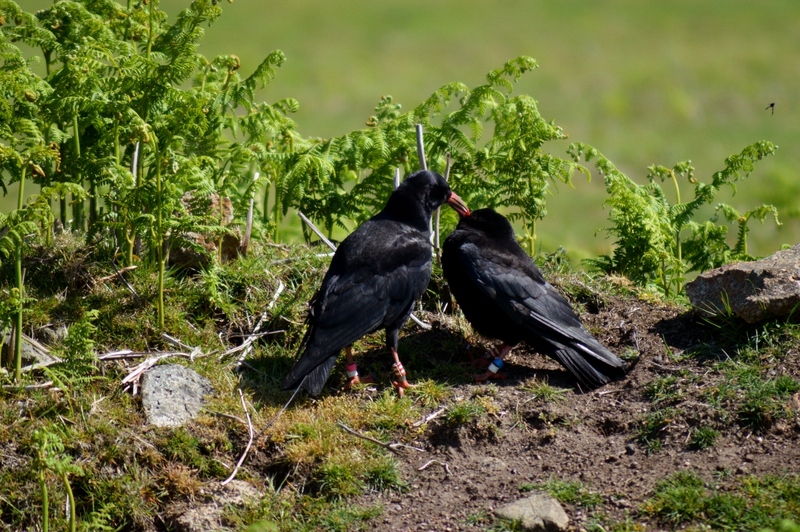 Both pairs took a long time to progress from a few twigs in their nest-box to a fully lined chough nest. Then it was a matter of waiting for the first egg. It turned out to be a very long wait to the point we had almost given up expecting anything. Seventeen days after Issy laid her first egg Gwinny and Mrs D started laying their own. Denzel and Mrs D have very little experience in breeding and this is their first time together. Everything appeared ok when Mrs D laid her first egg. Then keepers had a moment of doubt when they checked the nest cameras. “I’m sure there was an egg there before?”, “Is that an egg or a bit of wool?”, “It’s ok its still there”, “Wait, has the egg gone again?” Checking back over the camera footage we realised that what was hoped to be lighting issues and camera trickery was actually Denzel carefully removing the egg from the nest and Mrs D laying her second egg. He did the same thing to the second egg in the evening when staff had gone home. The remaining eggs were rescued before he had chance to act and given to Gianna to foster incubate. A slightly different scenario played out next door in Gwinny and Lucifer‘s nest-box. This time it was not just the eggs in danger. Gwinny and Lucifer have had clutches for the past two seasons. There have been issues with each clutch and eggs being tampered with. Staff usually have to rescue to artificially incubate. CeCe being the result of last year’s rescue efforts. We were quite prepared for the same to happen this year. What we were not prepared for was Lucifer‘s reaction to the first egg. As can been seen in the video below he became extremely aggressive to the point where Gwinny was in danger. Staff reacted quickly and re-housed Lucifer away from the breeding aviaries. There was the slight risk that Gwinny may abandon egg-laying due to the disturbance and not her ‘partner’ not being around. The risk to Gwinny by leaving him in the aviary far outweighed this and our actions were justified as she continued to lay over the next few days and has incubated consistently since then. Staff rescued the first egg as planned and gave it to Gianna to foster-incubate along with Mrs D‘s two rescued eggs. Gwinny went on to lay three more eggs which were left with her to incubate as she was sitting so well. Gianna has shown that she has learnt from her experience as a first time mother last year and is even more attentive to her nest this year. As with last year she was given a dummy egg to stimulate egg-laying. This seemed to work and a few days later she produced her own, followed by two more. This is quite interesting as last year her first egg was her only egg. Gianna will be used for foster-incubating and foster-rearing. We are not 100% confident in her ability to look after hatching eggs so any fertile eggs she has will be transferred to an incubator in the Bird Department and subsequent chicks hand-reared for the crucial first few days before returning to Gianna. Gianna will hopefully help out again by foster rearing this year. Photo by Liz Corry. 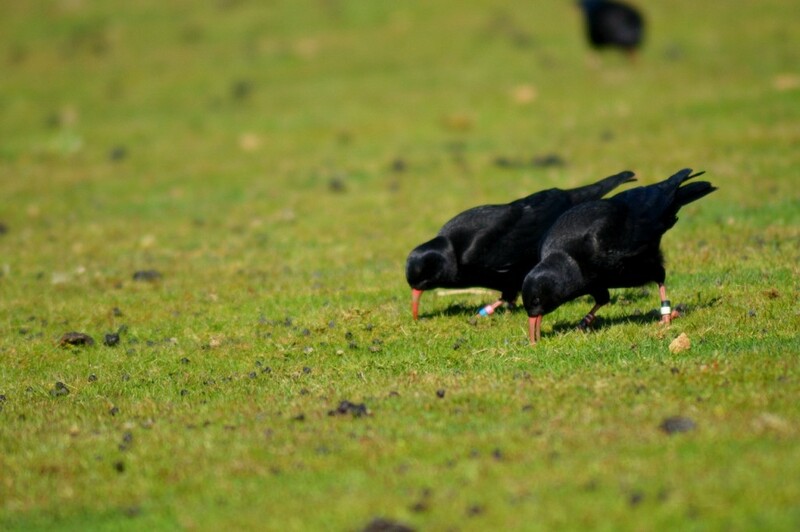 It was a little harder to determine when the choughs at Sorel started egg-laying. 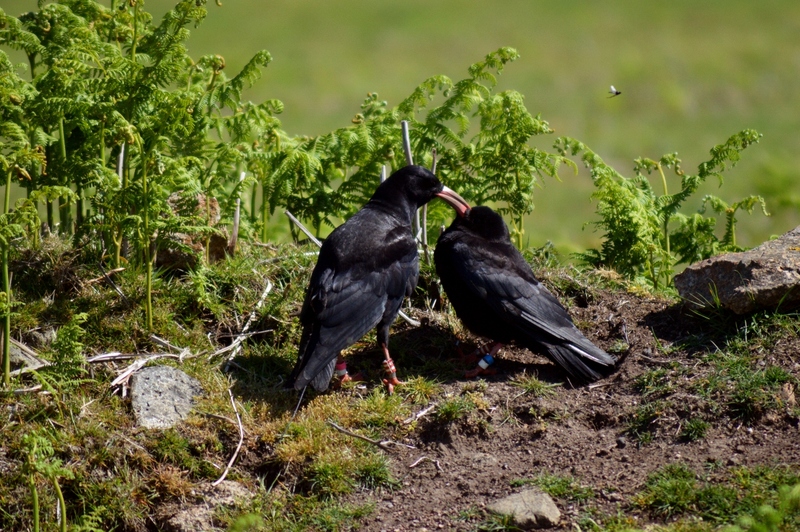 There was a period towards the end of the nest-building stage when the males started displaying to their partners and several mating attempts were observed. Green in particular liked to show off by spreading his wings to full extent and parading around Black. Or any other female that happened to be in sight. Green showing off the size of his wings to his partner (on the right) on the roof of the aviary. Photo by Liz Corry. Dingle joined in with collecting wool for his nest with Red. This is really promising behaviour and progress from last season when he partnered up for the first time. 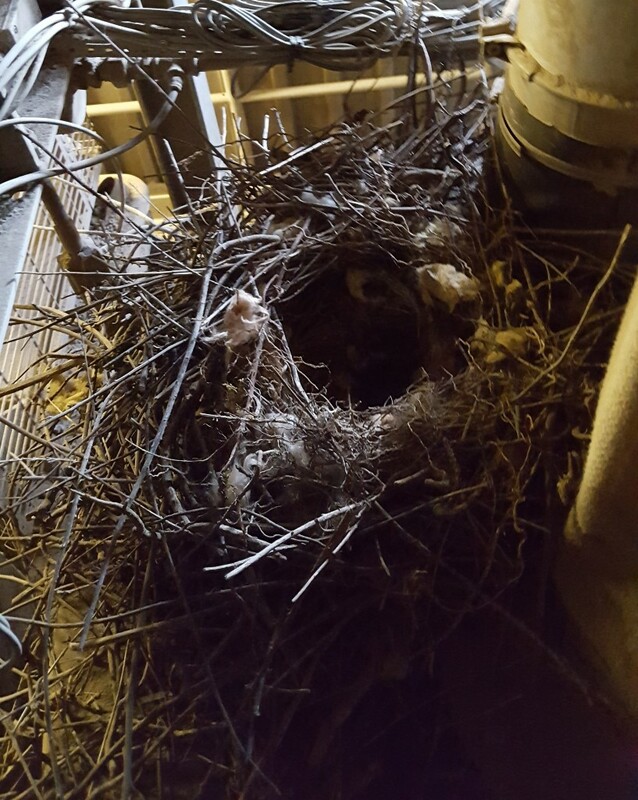 He has also been observed taking nesting material from the quarry in the form of lagging around pipes. Very resourceful. 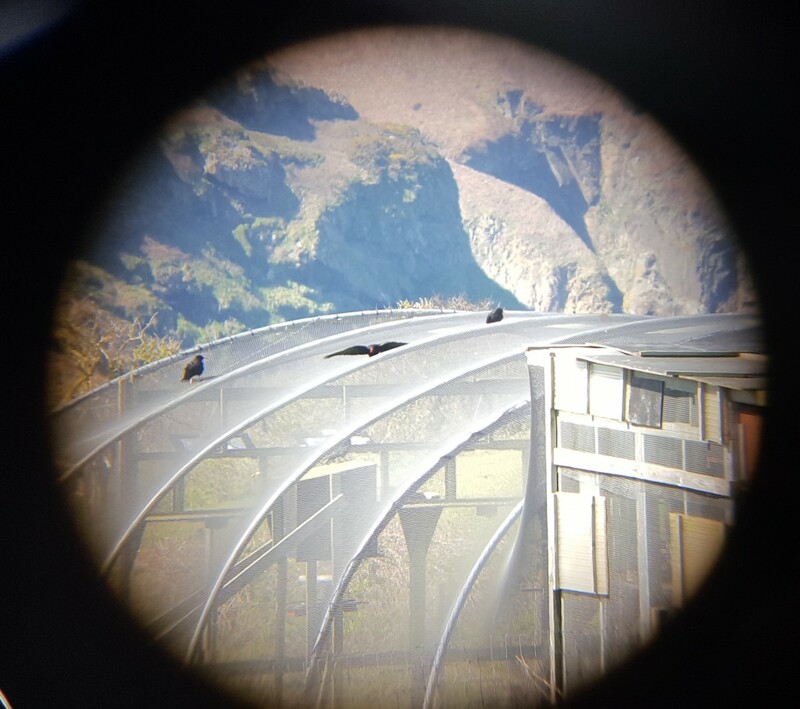 A recent roost check showed that the pair have switched from roosting at the aviary to roosting in the quarry. A sure sign they now feel invested in their nest and want to keep a close eye on it. Dingle collecting nesting material from outside the aviary. Photo by Liz Corry. We determined that the females had started incubating eggs by observing behaviour before and after the supplementary feeds at the aviary. Black was the first no-show of the three incubating females. As it is only the females who incubate the eggs they try not to leave the nest too often. When they need to leave, they need to know ‘abandoning’ their eggs is worthwhile. 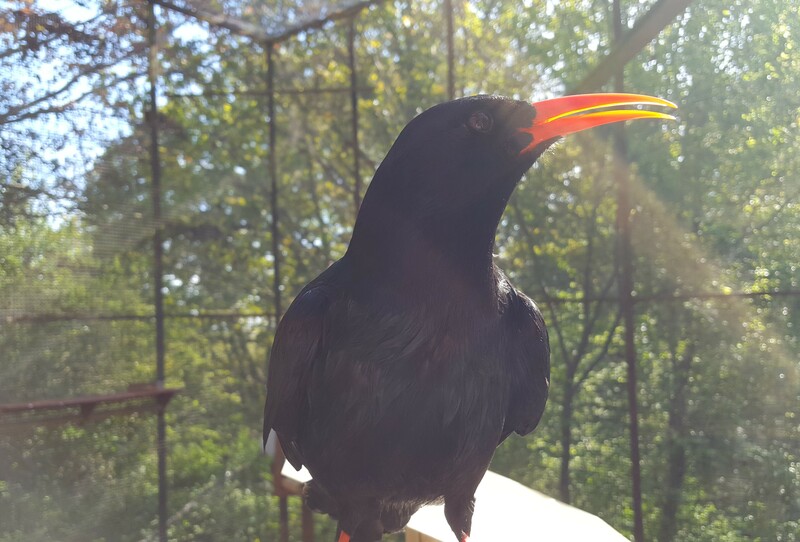 The choughs know when to expect food at the aviary because staff stick to set times. 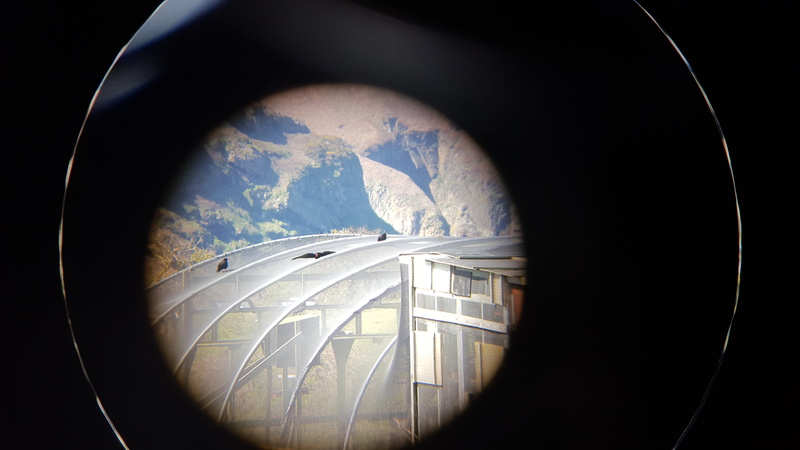 Sometimes, however, staff are delayed so instead of taking the risk of flying to the aviary to find there are no food dishes out Black waits for Green to return with the supplementary diet, thereby letting her know staff have put the food dishes in the aviary. After a minute or two discussing the tardiness of the keepers and what’s on today’s menu, the pair will then head over to the aviary, quickly feed, and return on a full stomach to continue incubating the eggs. Mauve and Red followed suit so now all that remains is to continue observing behaviour and count down the days to the expected hatch dates. We still have the young pairs feeding and preening each other but not yet ready to nest. A new pairing we noticed this month was that of Lee and Caûvette. It will be interesting to see if this relationship continues throughout the year. Caûvette was hand-reared. Any nesting attempt by her will be followed with great enthusiasm not just by the chough team, but by other reintroduction projects around the world. Lee and Cauvette, a hand-reared female, have paired up. Too young for this year’s breeding season but promising for next year. Photo by Bea Denton. The other new pairings appear to be going well. Q and his female Noir can be seen below taking part in a spot of mutual preening after lunch. Q and Noir have bonded over the past couple of months. Photo by Bea Denton. Q invites Noir to return the favour and preen him. Photo by Bea Denton. We had one piece of information this month which helped add solid facts to our breeding records, but also brought with it upsetting news. 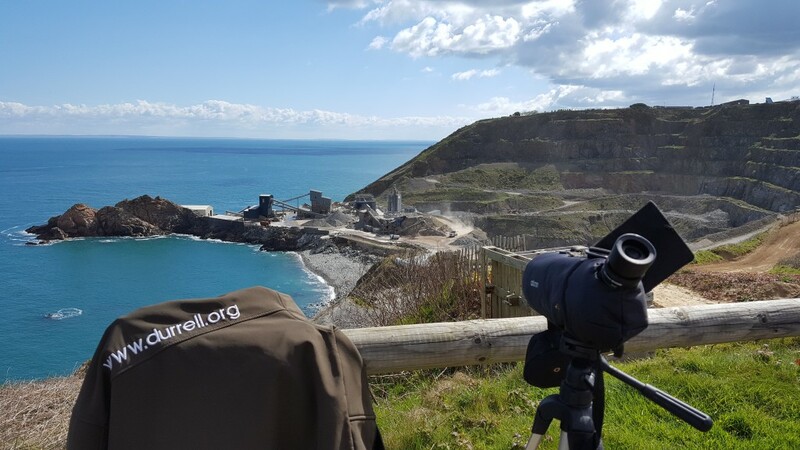 Early morning on the 4th April and email came in from quarryman Kevin Le Herissier that said “have a bit of good news and a bit of bad news”. I might have then stolen his thunder by suggesting the good news was the discovery of a chough nest. What could not have been predicted was the bit that came next. The bad news. Kevin had been working in the asphalt plant that morning and suddenly heard a group of choughs alarm-calling outside. He noticed several birds looking very distressed, hopping around on the ground, shouting at something. 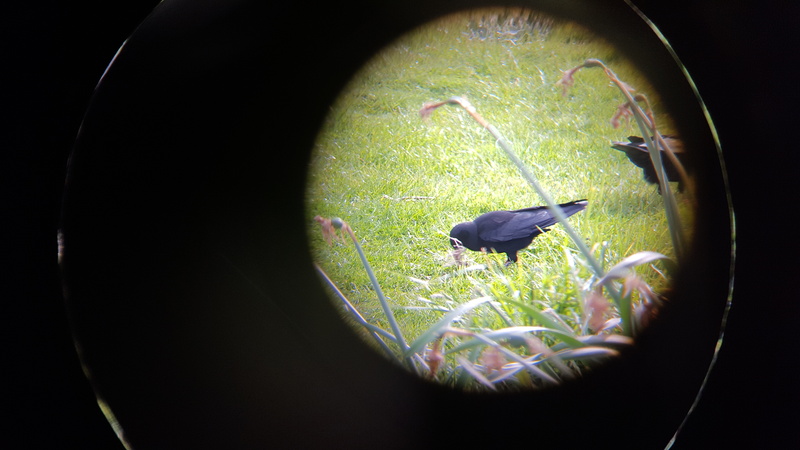 When he got closer he realised that in amongst the cacophony of choughs there was a chough head! No body, no feathers, just a head. We arrived on site shortly after the phone call and after a little detective work we found, at various sites, a piece of wing, intestines, and tail feathers with a radio transmitter attached. From this and her absence at the aviary feeds we knew the deceased was Ormer one of the 2015 chicks from Paradise Park. 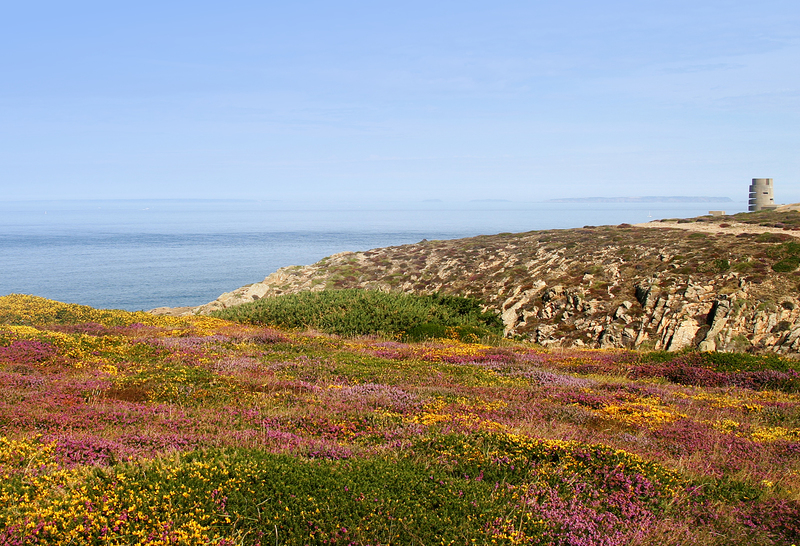 Ormer was found dead in the quarry this month potentially predated by great black-backed gulls. Photo by Liz Corry. Whilst not wanting to sound uncaring, quarry and bird staff breathed a sigh of relief. It was not one of the breeding females and it was not Dusty the wild chick. A loss nonetheless though. I presented the remains to a somewhat perplexed vet team to try to gather as much information as possible from a post mortem examination. Blunt trauma fracture on the skull and descriptions from quarry staff suggest that Ormer and the others had had a run-in with the gulls who also nest in the quarry. Great black-backed gulls are notorious for their aggressiveness and predatory behaviour and were seen nearby (a number of pairs nest in the quarry alongside the more numerous herring gulls) and were considered responsible. 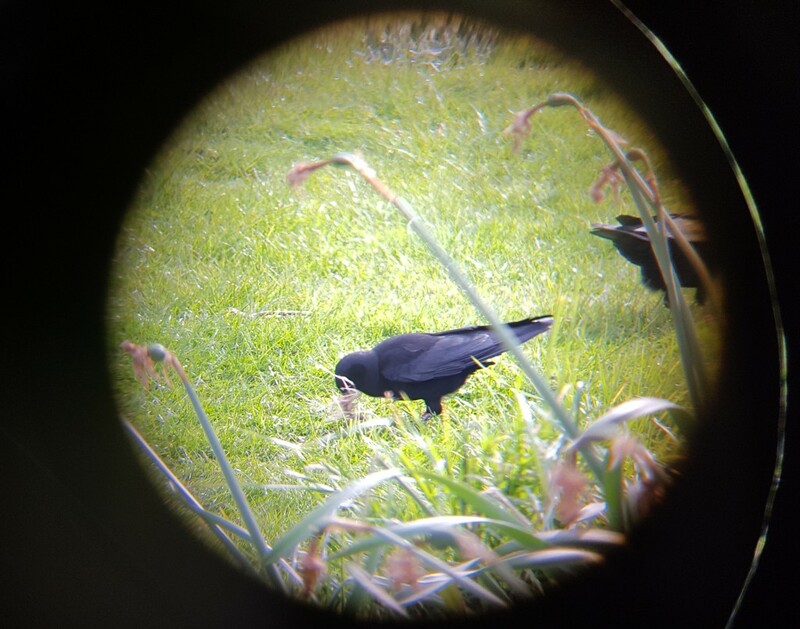 We have observed choughs chase off gulls (normally, or always, herring gulls) simply so they could play on the rocks the gulls were sitting on. Some may use the term ‘bullying’, but we like to think of it as being over-confident. Unfortunately this time around Ormer met with an even more confident species. 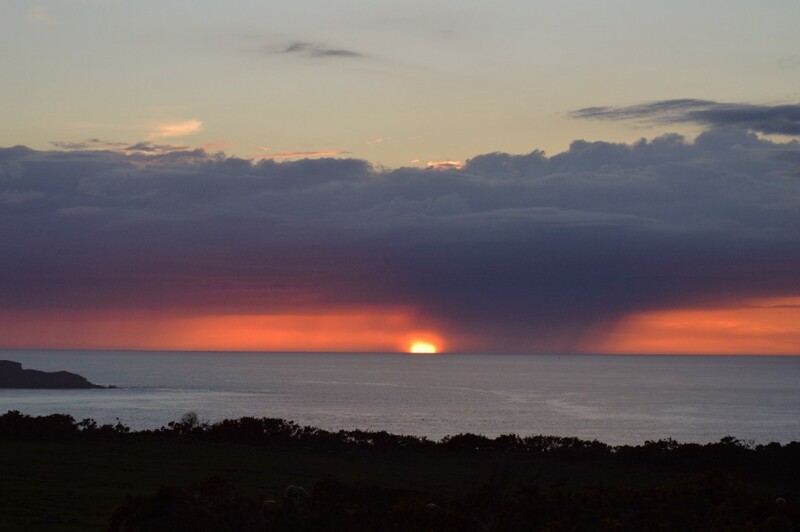 Another impressive sunset as staff carry out a roost check. Photo by Bea Denton. Yet another great report, thank you, very informative and makes compulsive reading. Sorry to hear about Ormer’s fate. But aside from that, it seems things are going fairly well. I was interested to read again about the business of the male removing eggs from the nest. This is a behaviour I’ve observed with “my” Starlings. I was first alerted to it last year when doing a box checking round (just listening for young) and finding several broken eggs under one of the boxes. My first assumption was an attempt at predation, but such attempts are usually successful (ie I would have expected a weasel, rat or stoat to have eaten the eggs). 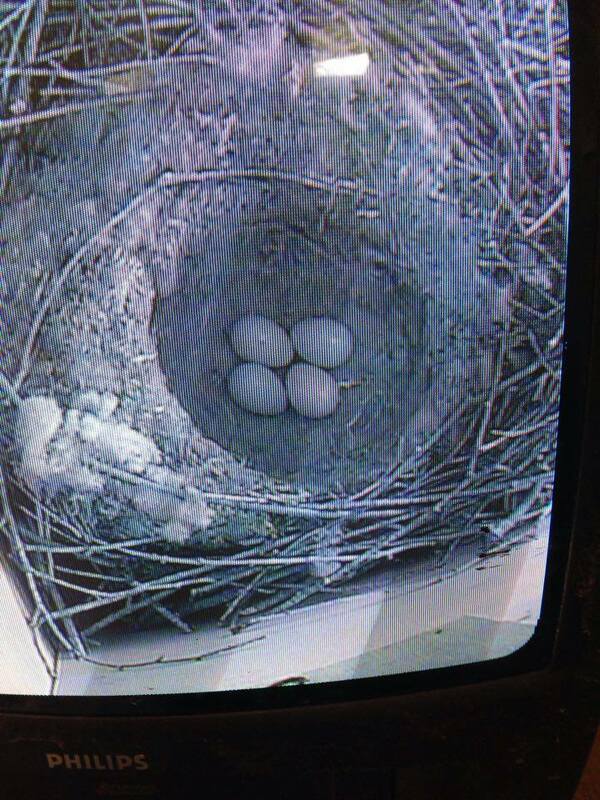 So I checked the nest the next day and found a new egg had been laid. After watching carefully (for quite a long time!) I saw a male (blue at the base of the bill) entering the nest and popping out again with the egg, which he dropped on the ground nearby. 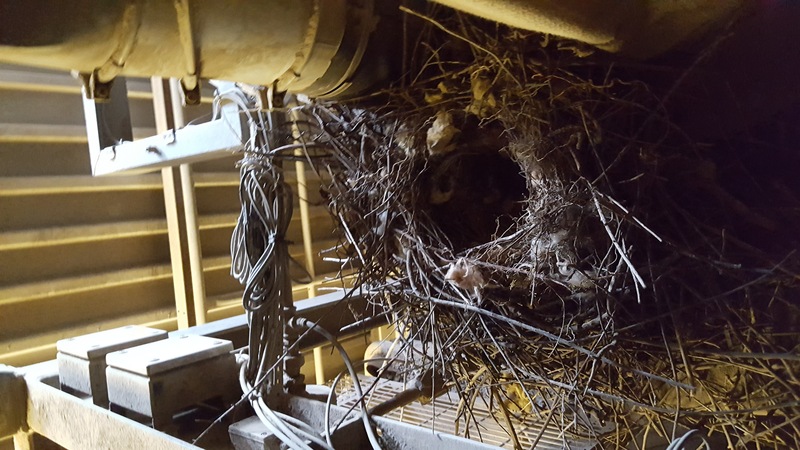 I still haven’t worked out what was going on, but my suspicion is that it has something to do with nest parasitism or equally, some sort of unfortunate response to my regular checking of the boxes. This year, I have checked only once in order to ring the pulli and have otherwise kept all my observations a’ la distance. And I haven’t observed this egg removal thing. Any ideas? Do you think it’s my ‘interference’ which may have caused it? Hiya. I think you may well be right with the interference. Birds will do strange things when they feel threatened. I think that Satan’s behaviour may be a facet of captivity in that he feels stressed by the space even though he’s born in captivity. I have had teal breed happily in very small aviaries but I’ve not been able to check on them closely whereas the same birds in much larger aviaries could be easily manipulated. It could, in Satan’s case, be a facet of his rearing. He’s not hand-reared I believe but he is showing behavioural problems – he did get his name after the problems were first seen! Many thanks Stan. I hope you’re doing well and thanks for your continuing support.